Elizabeth is a 8 year old cow that out produces herself year after year. 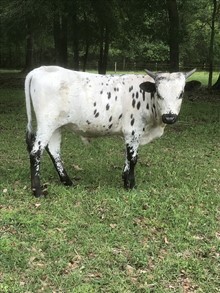 She currently measures 61" TTT & 73" Total Horn and is a flashy black and white cow. She is sired by BN Storm who is a Boomerang CP grandson. She currently has a beautiful flashy, black & white bull calf at side. The calf is sired by Big Wig.